No carbs! No calories! No cheese! Each cracker is lovingly baked (cast) and packed fresh in Harlem, New York using retro state-of-the-art -- circa 1913 -- technology, plus some modern silicone. In 2005 we created the Cracker Tracker after receiving numerous emailed pictures from cracker collectors around the world. Each cracker comes with a unique serial number that allows you to post pictures with your American Snack Food Icon. One reviewer went so far as to compare me to the great Campbell's soup silkscreen artist: "With my first token, I get a brown box marked "Cracker" by an artist named Herbert Hoover of Harlem. 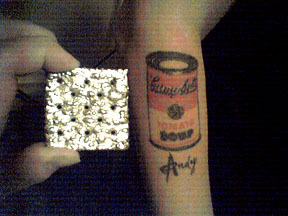 Inside, folded in nifty silver bubble wrap, is an unmistakable Saltine cracker, cast in pewter, a neat-o bit of pop art to be served with Andy Warhol's soup cans."